Famed for its impressive architecture spanning centuries, Cleveland has a wealth of historical buildings, eye-catching landmarks and important monuments. Notable memorials and places of interest within this city come in the form of old churches, parks, statues and mountains. 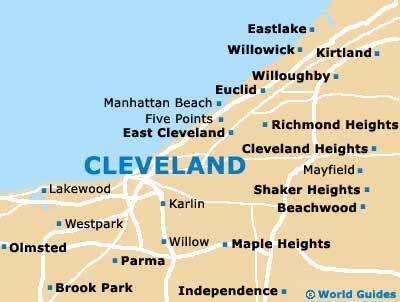 Cleveland also has a fine European-style square, an interesting skyline and many listed National Historic Landmarks. The city itself is based on a number of irregular bluffs, which tend to run parallel to the shoreline of Lake Erie and are bisected by the Cuyahoga River, as well as both the Euclid Creek and the Big Creek. The Public Square has become an integral part of downtown Cleveland since it was completed in the early 1860s and this centrally located plaza occupies some four blocks, being bounded by Frankfort Avenue, and the East, West and South Roadway, while Ontario Street and the West Superior Avenue intersect the square and divide it into quarters. 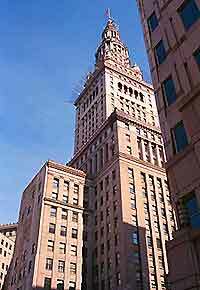 This is a great place to see three of the city's tallest and most imposing buildings, namely the Terminal Tower (1928), the Key Tower (1992) and the 200 Public Square (1995), the latter of which is also often referred to as both the Sohio Building and the BP America Tower. Visitors to the plaza may also like to check out the monument to soldiers and sailors, which resides within the southeastern quadrant. The Public Square is the central gathering point of the city, with the Terminal Tower as its centerpiece. This animated city plaza is comprised of four separate quadrants and is considered to be the heart of the downtown district. The square makes a great place for people watching and relaxing. The Terminal Tower is one of the city's most prominent landmarks and is also the focal point of both the skyline and the Public Square. At 700 feet / 213 meters high, visitors to Cleveland can't miss this stunning skyscraper. Built in the stylish late 1920s, the tower is a favorite meeting spot and houses one of the area's biggest department stores, together with a mall, food court, movie theaters and a train station. 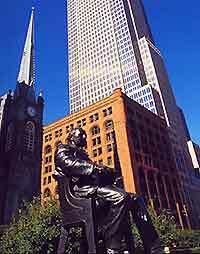 John D. Rockefeller donated 270 acres / 109 hectares of land to Cleveland, being his very generous present to the city on its 100th birthday. The land became Rockefeller Park, which now houses 24 gardens and the city's imposing greenhouse. 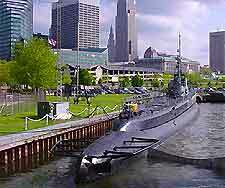 Docked on Lake Erie in downtown Cleveland, the USS Cod Submarine Memorial is listed as one of the area's National Historic Landmarks. This WWII submarine is maintained in its original condition, giving visitors a glimpse of the past as they use the original hatchways and ladders on their tour of the submarine. This historic market sells fresh produce including homemade cheeses, baked goods and vegetables. 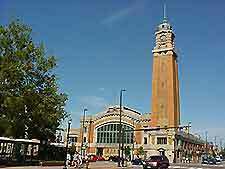 The West Side Market has been open for more than an entire century. It boasts an impressive clock tower and is housed in a beautiful Neo-Classical, Byzantine-style building.